I just completed a trip to Massachusetts, including the city of Boston and the Greater Boston area. While stuck in traffic several times (too many), both in Boston proper and on the surrounding highways, I started to muse, first, about why the traffic is so bad, and, secondly, about my old stomping grounds — namely, Massachusetts, where I grew up — vis-à-vis New York City. Boston and, notably, Massachusetts towns, are charming, quaint and pristine. Clean. Well kept. Picturesque. New England has a beauty that, in my opinion, is hard to match. But, I feel that my adopted region, the New York City metropolitan region, grubby as it is, is superior. My trip got me thinking about Boston and Greater Boston traffic. Believe it or not, it’s WORSE than New York City. And, about the reasons this is so. I think a major reason is that Boston is mostly a car city and the surrounding towns are totally based on automobile transportation. It’s a car culture; people don’t walk. Unlike New York City. But Boston has a good public transportation system, one might say. The T branches out to and reaches the exurbs. It’s well run and commodious. True, it would seem, but the New York City public transit system handles much more people every day, a much larger segment of the population. A significant percentage of persons in the Tri State area (New York City, New Jersey, Connecticut) rely on public transportation instead of cars. And, in Boston, one sees a lot less cabs and far fewer buses than in New York City. Bottom line, public transportation is much less of a factor, plays an almost insignificant role, comparatively speaking, in the overall Boston and Greater Boston areas. New York lives, breathes, and dies by its public transit system. There is no alternative for many city dwellers. Boston shuts down at the end of the business day. There is no one on the sidewalks at night, except for a few popular night spots, and hardly anyone after they close. New York never shuts down. Boston proper and the surrounding towns have a lot less small stores. You will see a sub shop and perhaps one deli (except they don’t seem to call them delis) in the center of town. But, there are zillions of delis in New York city — they’re everywhere. In Boston proper, it’s hard to find one. In Boston, it’s very noticeable, and highly significant, how little pedestrian traffic there is compared to New York. Perhaps that’s why there are less small stores to accommodate a passerby who might want to buy a Coke or bottled water. True, the central city sections such as Copley Square are crowded with pedestrians during the business day. But it’s much different later. After normal business hours, beginning with the early evening, there is very little pedestrian traffic in Boston. Many downtown blocks seem virtually deserted. The city shuts down after the business day ends. So different from New York. Stroll through Manhattan or the outer boroughs at almost any hour of the day, including the wee small hours, and you will find that very few streets are deserted. There is, naturally, less pedestrian traffic at 2 a.m. But, it is an appealing and actually comforting fact that there is almost always someone on the street. In the case of Manhattan, most neighborhoods never shut down. One thing I have always liked about New York City, particularly Manhattan, is: walk through any part of the city, including central commercial and business areas, and you will see residential buildings. Some neighborhoods are primarily commercial, others are primarily residential. But, residential buildings are everywhere. All sections and zones are inhabited, which means there are always PEOPLE around regardless of time of day. Boston’s “culture” can’t hold a candle to New York’s. There is a plethora of cultural activities in New York year round, as everyone knows. I have never been a theatergoer, but, while Boston and Cambridge might have a theater or two, New York has scores of them showing plays and musicals all the time. The amount of music one can find being performed in New York City on practically every day of the week year round is astonishing. Besides Lincoln Center and Carnegie Hall, there is a mind boggling assortment of musical performances and venues to choose from. Plus, there are innumerable amateur musical performances (including a wealth of music performed in churches) and recitals by student ensembles and so forth. The same is true of other cultural events, and also lectures. And, of course, New York is the film capital of — if not the world — indisputably the USA. Massachusetts has Cape Cod. I don’t think the Hamptons on Long Island can come close. But, while visiting, I got lost on back roads on the Cape and drove around for a half an hour or so trying to find my way back to a major route. During this time, I had the opportunity to observe the Cape as a year round resident might experience it. It’s still a nice place with good restaurants, a great, breezy climate, beautiful beaches and spots, and so forth. But, it has in many places become indistinguishable from your standard suburbs. Nothing special. Streets which are often cul-de-sacs. Nice but typical houses. Boring in a way that only the suburbs can be. The typical suburban pattern of streets that lead nowhere. New England does have nature; it is preserved remarkably well. Beautiful old trees seemingly everywhere, arching alongside and over thoroughfares. They and their abundance are splendorous. Stately old trees notable for their grandeur, the proper names of which I do not know (elms?) but wish I did. There’s nothing like it in New York City or surrounding areas. New York City trees tend to look like they’re sick a good part of the time. In the fall, the leaves shrivel up and fall off; there is no glorious foliage. I have a sneaking suspicion, but cannot prove it and do not know it to be fact, that Boston might be more segregated than New York City. Patterns of de facto segregation in terms of housing still persist in New York City’s outer boroughs and can still be seen, to a lesser extent, in Manhattan as well. But, I believe that New York has always been more liberal with regard to race than Boston. I was at the Morgan Library last weekend on Saturday, June 10 to view two excellent exhibits on Thoreau and Henry James. As an example of the cultural richness found in NYC, here’s a sampling of what’s offered (besides the museum’s exhibitions). This entry was posted in cities; urban living; urban policies and planning, general interest, personal views of Roger W. Smith and tagged Roger Smith, Roger W. Smith on June 11, 2017 by Roger W. Smith. Below: Fifth Avenue at 34th Street, 1:59 p.m., Monday, May 8, 2017. Traffic flowing just fine on a weekday and is in fact light. Below: two photos of pedestrians on Fifth Avenue in Midtown near 42nd Street and in the 60’s just north of 59th Street. “One of the world’s densest concentrations of humanity”? Fifth Avenue near 42nd Street, 5:47 p.m., September 7, 2016 — rush hour: where are the “traffic bedlam” and crush of pedestrians? It is a horrible piece, founded on plain bad thinking. It doesn’t take a traffic engineer, city planner, or urban studies professor to see this. If Jane Jacobs could read this piece, she would be rolling over in her grave. Below are the points made by Ms. Sadik-Khan (in boldface), followed seriatim by my commentary. So what? Fifth Avenue has been a Manhattan thoroughfare over 150 years; Donald Trump’s presidency will last at most for eight years. Fifth Avenue is approximately 135 city blocks — or just under seven miles — long from south to north. Donald Trump’s residence, Trump Tower, is situated on a single block between 56th and 57th Streets. Except for the fact that a few sections such as streets in the vicinity of Trump Tower have been closed to traffic, causing traffic problems (and a block long stretch of the avenue having been closed to pedestrians on the block where Trump Tower is located),* traffic on the avenue usually flows smoothly, as I have observed for years — there is hardly ever “traffic bedlam.” Yes, there is often a dense concentration of humanity on some parts of the avenue, such as near Rockefeller Center and Grand Army Plaza, but wide sidewalks make the avenue very walkable, and there is nothing like the congestion, pedestrian wise, that one often experiences in Times Square. Fifth Avenue is not “home to one of the world’s densest concentrations of humanity.” Factually inaccurate. Maybe Calcutta. * This was a problem in January 2017 when this post was written. With Trump having moved to Washington, pedestrian and vehicular traffic on Fifth Avenue near Trump Tower now flows well. Some side streets are still closed off. So what? Landmarks make the avenue special. Expensive retail shops give it a feeling of luxuriousness. Yes, Fifth Avenue is a premium locale, Manhattan’s priciest and most exclusive avenue, with expensive properties. Is that a bad thing? People of modest means or less than high class status are by no means barred from it. This is too bad. But is the solution for this inconvenience to restrict access to the avenue even more? When and to what end, I ask. What will this accomplish? The solution proposed is right out of Part III of Gulliver’s Travels (“A Voyage to Laputa”; the opening chapters of same). More power to him (and Madame Trump). For this, the traffic czars want to restrict traffic access to Fifth Ave? Ditto. I don’t like the disruption of traffic and pedestrian flow caused by Trump Tower’s being the home of the newly elected president. Let’s hope they don’t “permanently paralyze the city’s streets.” Is she thinking of shutting the City down? Who says (why in God’s name does she?) that Fifth Avenue has to be “reclaimed?” As if we were in the South Bronx of the 1970’s. “[R]eclaim Fifth Avenue as a pedestrian street.” What? It’s already a great pedestrian street. (See photos below.) It’s not in need of “reclamation”! Highfalutin psychobabble. NONSENSE masquerading as wisdom. “Herded along”? I can walk just fine on Fifth Avenue, thank you very much, without any one redesigning it for me. It’s a great street to walk on. So much fun. Wide sidewalks. No impediments, save for the barriers and police presence between 56th And 57th Streets, which I myself don’t like, and which are quite recent. Because of this, this nutty “savant “wants to shut down fifteen more blocks of the avenue (to traffic). “Room to reflect on their civic institutions”? That’s a good one. Is this what the people in the photo below of Times Square’s truly horrible public space are doing? Think about it. Traffic runs one way on Fifth Avenue (downtown, from north to south). This was the result of making Manhattan’s avenues one way in the 1950’s to improve traffic flow. There are ample sidewalks on either side of the avenue, which give pedestrians the opportunity to not only stroll the avenue and people watch, but also to look at and perhaps visit the shops and institutions which they pass. For example, I like to walk past the New York Public Library on Fifth Avenue between 40th and 42nd Streets and admire its beauty and grandeur (people are always congregated on the library steps and in front of the building, enjoying the sun in the summer time, taking photos, enjoying a coffee), past department stores such as Lord and Taylor’s at 38th and Fifth Avenue, and so on. Fifth Avenue is a great street to walk on, plain and simple. But what does Janette Sadik-Khan, who is anti-automobile, propose doing? Shutting down three lanes of the avenue, which would be exclusively for pedestrians. Why? Who wants to walk in the MIDDLE of the street, and who said there wasn’t already a place to walk? As I have said above, traffic flows fine right now on Fifth Avenue, at most times; obviously, it flows better at some times than others. There was severe traffic congestion for a day or two right after Trump was elected when demonstrations were taking place in front of Trump Tower, and there may be congestion — near, say, Rockefeller Center — around Christmastime, but even that is occasional. There are nice wide sidewalks already for pedestrians to walk on! I like the traffic on Fifth Avenue. While strolling on the broad sidewalks north of 59th Street (cobblestone on the west side of the avenue) — with Central Park to one’s left; or, conversely, on the other side of the street, luxurious apartment buildings — I like to mix with the pedestrian throng while at the same time viewing the cars and buses as they rumble down the avenue. There’s something pleasant about realizing that not only is it a beautiful avenue, but that it also serves a purpose as an efficient conduit for north-south traffic. I rarely drive or ride in a car when in the City. I love being a pedestrian because of the peaceful feeling, the exercise, the opportunity one has to view, at a leisurely pace, any and all sorts of interesting places and commercial establishments. Fifth Avenue is already great to walk along. So now we have to create three dedicated pedestrian lanes. For what? So that people can walk in the avenue. Who wants to walk there? What’s wrong with the good old sidewalks? They do attract a lot of pedestrians, which make them even more fun to stroll on. But, pedestrian traffic is almost never impeded, for any reason whatsoever – except for the situation in front of Trump Tower, which is not the result of Fifth Avenue being Fifth Avenue. What, in the name of God, is an “enhanced delivery zone”? Why harass cab drivers? It’s tough enough for them to make a living, and it’s very hard to hail an unoccupied cab in the City. Ban cars and taxis from a stretch of Fifth Avenue. Why? Every time this sort of thing is done, it creates more congestion on the other avenues which flow from south to north or in the other direction. Says who? The clueless author of this article, that’s who. Really? My wife likes to drive to shop at a fancy store on Fifth Avenue on off hours when traffic is light and parking is available. How will deliveries be made to these retail establishments? I have already noted that Times Square is unpleasant to hang out in because of the changes made by Mayor Bloomberg and his traffic commissioner, Ms. Sadik-Kahn. The public spaces, to put it kindly, are horrible. Don’t take my word for it. Go there sometime, if you can. Wishful thinking, Ms. Sadik-Khan is totally anti-car and is in la la land, so to speak, as regards transportation realities. It’s the polar opposite of (insofar as Ms. Sadik-Khan is anti-car), but the same high handed, autocratic “we know what’s best for the public” attitude that the urban designers who were totally anti-pedestrian, of the 1950’s had. Drivers in NYC are always looking for alternate routes. Why foist on them the burden and aggravation of having to look for more? Shutting down a stretch of Fifth Avenue to vehicular traffic will force a spillover of traffic to avenues further east, such as Park, Lexington, and Second Avenues, which are already clogged. In other words, let’s get rid of cars, which will supposedly force people to walk, ride bicycles, or take the subway. A utopian, impractical scheme. I myself prefer to walk or take public transportation. But, as Jane Jacobs wrote in The Death and Life of Great American Cities, “automobiles are hardly inherent destroyers of cities”; they are not bad. Many people prefer them. Others need to use them. And, cars and vans are an efficient way to make deliveries. This is purple prose and pure nonsense. Pray that her loony idea never comes to fruition. P.S. An op ed page should be a place for divergent opinions. But, really, what were the New York Times editors thinking when they published this piece? Does it echo their thinking? I have a sneaking suspicion that it does. Social engineers are always trying to retool institutions, overhaul codes of behavior, alter public spaces, and so forth, supposedly for our “betterment,” ignoring accumulated wisdom, common sense, and the experience of life as the benighted masses actually live and experience it. Also below is a photo by Roger W. Smith of another one of the urban “oases” (read, eyesores) created by Ms. Sadik-Khan: the Garment District seating area at 40th Street and Broadway. Hardly anyone is there, and the seats are empty. It serves mainly to create another traffic obstruction. Below are photographs of Fifth Avenue taken by Roger W. Smith in the early afternoon on Saturday, February 4, 2017. Take a look. Where are the “traffic bedlam” and the crowds? “[H]ome to one of the world’s densest concentrations of humanity and traffic bedlam”? Where is the heavy vehicular and pedestrian traffic that the traffic engineers have been writing jeremiads about? They want to solve the “problem” by shutting part of the avenue down. I took the above photo on Fifth Avenue in the 40’s at midday on a Monday afternoon in August 2018. Where is the traffic jam? The truth is that traffic usually flows very well on Fifth Avenue, which runs in one direction, downtown, from north to south. No traffic crisis requiring the intervention of city planners. This entry was posted in cities; urban living; urban policies and planning, general interest, my city and neighborhood, personal views of Roger W. Smith, social engineering and tagged Fifth Avenue, Jane Jacobs, Jane Jacobs The Death and Life of Great American Citiies, Janette Sadik-Kahn, Roger Smith, Roger W. Smith on January 18, 2017 by Roger W. Smith. The above referenced New York Times article is about the massive traffic headaches that have already been created – and which are looming – mainly on Fifth Avenue and on streets and other avenues in Manhattan in the vicinity of Trump Tower. Trump Tower, the main residence, for the time being, of President-elect Donald Trump, is located on the east side of Fifth Avenue between 56th and 57th Streets. A couple of points that I would like to make before discussing the contents of this particular article, which thoroughly describes the problem. — New York City, it goes without saying, has always attracted people with star power: celebrities and magnates. Yet I have always thought and felt that it’s the sort of place which nobody can dominate. It is such a huge and such a great city that it cuts everyone down to size. I know that when I first moved to New York, as a young adult, I was awed by it. It seems to have that effect on everyone. It’s a welcoming place in many respects in that the atmosphere is so tolerant, of different races, lifestyles, ethnicities, persons high and low, and so forth. It’s welcoming, it’s also overwhelming. It seems to have that effect on everyone. It attracts; it excites; and, it intimidates. It has a way of cutting people with big egos down to size. — New York is one of the world’s greatest cities for walking. 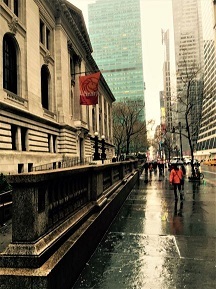 Fifth Avenue is among the best places to walk. Stretches of Fifth Avenue include some of the most expensive residences in the world and luxury stores. Yet, the avenue is accessible to all. The sidewalks are wide, the pedestrian traffic is not limited by any means to one social class, and it’s a just plain fun avenue to stroll on. It is aesthetically pleasing, rarely gets overcrowded (to the point where passage is difficult; an exception might be right in front of Rockefeller Center, where there is a giant tree on display during Christmastime; crowds are found there at this particular time of the year at certain times on certain days). The glamor, elegance, and upbeat quality of the avenue and its denizens from around the 30’s to around 100th Street seem to rub off on everyone; the pedestrians always seem to be cheerful and unstressed. You rarely seem to see something depressing. It looks like this is changing. It makes me very unhappy. Actually, angry. — Famous stores on the avenue have been blocked by police barricades. — Gawkers loitering on the sidewalk outside Trump Tower have presented a problem, both for pedestrians and security. — Pedestrian access to the east side of Fifth Avenue between 56th and 57th Streets, where Trump Tower is located, has been restricted. — When Trump moves to the White House, the situation is not likely to ease. It is expected that he will still be spending considerable time at his Trump Tower residence. And, Trump’s wife, Melania Trump, and the couple’s son, Barron, are to stay in New York in the near term. Last week, I had an appointment at the Apple Store at Fifth Avenue and 59th Street to have my iPhone battery checked. It was raining hard. I was doing a shopping errand for my wife at a department store at Fifth Avenue and 39th Street. I love to walk in Manhattan, and having to go from one place to another gives me a reason and incentive to walk. So, I headed north on Fifth Avenue, my preferred route and the most direct one. An alternate route would not make sense, and I much prefer Fifth Avenue to Madison or Park. But, I had to make a detour at Fifth Avenue and 56th Street. There were barriers on both sides of the avenue (east and west) which served the purpose of a sort of funnel. Pedestrians were lined up on either side of the avenue, awaiting an ID check that would enable them to pass. A depressing sight. I have never seen this before in New York. I was thinking what are they lining up for? It’s not worth it. Probably they wanted to be able to walk past Trump Tower and get a glimpse of it. Big thrill! I was reminded of an experience I had somewhere between fifteen and twenty years ago. I was walking during midday in Bryant Park, which is right behind the New York Public Library. The park runs between Fifth and Sixth Avenues and between 40th and 42nd Streets. I was on a gravel pathway right behind the library which abuts the park. There were few people around, and my path crossed that of ex-mayor Ed Koch, who was strolling the other way on the same pathway. Neither of us was in a hurry. I did not speak to Mr. Koch. I probably should have said, “Good day, Mr. Mayor.” But I kept going without speaking. I had the distinct feeling that he knew that I knew who he was – in short, recognized him. He peered at me. I had the feeling, intuition that he was thinking to himself, looks like an interesting face, an intelligent person (me). I was reminded about something I read about Walt Whitman when Whitman was working and living in Washington, DC during the Civil War. Whitman often spotted President Lincoln riding by on horseback for business or pleasure. “I see the President almost every day. We have got so that we exchange bows, and very cordial ones,” Whitman wrote in 1863. Mayor Koch, when I encountered him on my stroll, similar to the experience Whitman had when he saw President Lincoln riding by, seemed to be an ordinary citizen, no different than any other New Yorker. That’s the way it should be. Donald Trump is not larger than life. He should not be allowed to shut down Manhattan. This entry was posted in cities; urban living; urban policies and planning, general interest, my city and neighborhood, personal views of Roger W. Smith, social engineering and tagged Donald J. Trump, Donald Trump, Ed Koch, Edward I. Koch, Roger Smith, Roger W. Smith, Walt Whitman on December 5, 2016 by Roger W. Smith. It’s kind of a fun article. The reporter, Winnie Hu — is there such a thing as a BAD reporter on the Times? – does a very good job. But the supposed problem of overcrowded sidewalks in New York City is really not a problem, in my opinion — it’s a non issue. I am always walking, practically everywhere, in the city, it seems (that’s admittedly hyperbole). I occasionally do step off the curb and walk in the street to avoid obstacles. Usually, it’s not pedestrians that are blocking the way. It could be cars or trucks illegally parked jutting out onto the sidewalk, or perhaps (often) a construction site. Yes, certain areas are particularly crowded with pedestrians: Times Square; the Penn Station area; lower Manhattan (Broadway) in the vicinity of Houston Street and SoHo; Flushing, Queens. But, most areas aren’t. Take Fifth Avenue, for example. It’s a major thoroughfare for locals and tourists alike with many shops and attractions and lots of pedestrians, but it’s almost always pleasant and not onerous to stroll on. This is also true of most of Broadway (with the exception of Times Square), particularly in the Upper West Side. I walk everywhere and almost never experience pedestrian gridlock. Even on the most crowded streets. The traffic engineers should turn their attention elsewhere. Some people love to fret, complain, and worry about any and all perceived inconveniences, but, believe me, the walkers can and will continue to do just fine. This entry was posted in cities; urban living; urban policies and planning, general interest, my city and neighborhood, social engineering and tagged New York City, pedestrian traffic, Roger Smith, Roger W. Smith, walking, Winnie Hu on June 30, 2016 by Roger W. Smith.